You might not be able to tell this from its name, but Ka’u coffee is grown in the district of Ka’u. Ka’u is located on the Big Island of Hawaii just a few miles outside of the Volcano National Park. 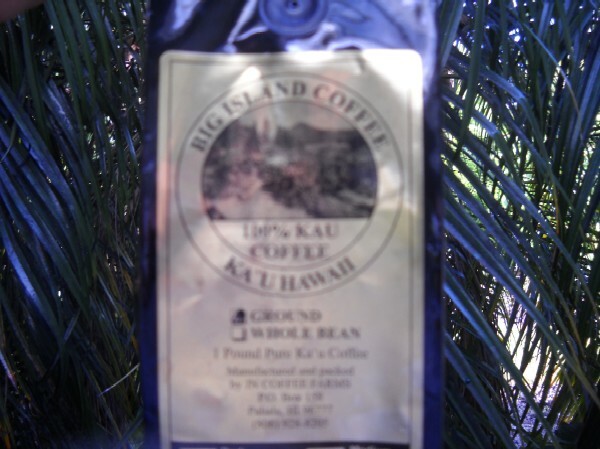 Now Kona Coffee is thought by many to be one of the finest coffees in the world and if you are interested in kona coffee you might want to view my Kona Coffee Review, but I think coffee from this obscure area, called Ka’u, that few have heard of is one of Hawaii’s best kept secrets. Now I’ve tried both Kona Coffee and Ka’u Coffee and if Kau Coffee isn’t comparable to Kona Coffee, I’d have to say that it is very close in quality and flavor and it is one of my favorite Hawaiian Drinks. A bag of my Ka'u Coffee from Big Island Coffee. And you know what the best thing about this little known coffee is? It’s the price; it is significantly less pricey than Kona Coffee, because so few non-locals know about it. But how long will this incredible coffee from Ka’u remain Hawaii’s best kept secret? My wallet hopes that the answer is forever. P.S. : You didn’t hear this from me…You may have already had Ka’u coffee and not even realized it. I’ve heard a few rumors that some “kona coffee” was really grown in Ka’u and secretly smuggled into Kona for roasting and packaging under the Kona coffee label. But these are just rumors after all.